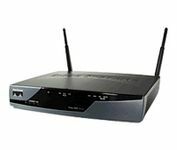 Cisco 877W integrated services router is a Wireless ADSL fixed-configuration routers that support multiple types of DSL technologies, broadband cable, and Metro Ethernet connections in small offices. Cisco 877W has features such as VPN, DMZ port, WCCP 1.0, Manageable, Auto-uplink, NAT support, PAT support, DHCP support, IPv6 support, URL filtering, Firewall Protection, MAC address filtering, Auto-sensing per device, Power over Ethernet (PoE), Intrusion Detection System (IDS), Intrusion Prevention System (IPS), Automatic Route Processing (AutoRP). Cisco router supports networking standards such as ANSI T1.413, IEEE 802.1Q, IEEE 802.1x, IEEE 802.11b, IEEE 802.11d, IEEE 802.11g, Wi-Fi Certified. Data link protocol supported are ATM, Ethernet, IEEE 802.11b, IEEE 802.11g, Fast Ethernet. In addition, the Cisco Router and Security Device Manager (SDM Express web interface) Web-based configuration tool allows easy setup and deployment, and centralized management capabilities. TrustedReview reviewed Cisco 877W integrated service router and concluded that the 877W is offering a stunning level of security features all accessed and configured from a well designed management console packed to the gills with wizards. Some features require additional components to be running separately but small businesses and remote offices that want the best money can buy need look no further.